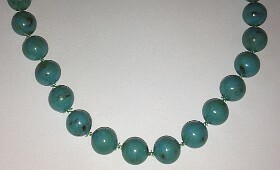 Extra Long string of beads in immitation Turquoise colours and shades. Massive length 1200mm string of amazing looking plastic beads. Perfect size 10mm gauge round shaped beads with light blue turquoise natural marbled colouring effect making each bead vary in colour and shade to simulate real turquoise look.